There are many reasons why dental visits are important and should take place two or three times a year. Unfortunately, some people only visit a dentist when they have an emergency. Even with all of the dental education taking place, many people still do not comprehend that dental health also affects their overall health. Regular dental check-ups catch many potential problems before they become problematic. A normal visit begins with a dental hygienist asking patients if they have had any problems since their last visit. Then a thorough cleaning of the teeth begins. It is essentially a deep cleaning in that it extends to underneath the gums and as much as possible of the plaque is also removed. If a patient’s dental care has been inadequate and a hygienist has not been seen for some time, all of the plaque may not be able to be removed in one session. 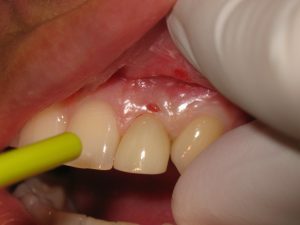 The patient is informed of the condition of the gums. They will likely be asked how often they brush and floss, as well as what kind of tooth brush they use. Some dentists insist that their patients use electric brushes while others do not take such a firm stand. They, instead, say that the important factor is that the patients brush and floss regularly and properly. The hygienist will quite often demonstrate the proper method of brushing and flossing. This is especially important if the gums are not a nice healthy pink but a puffy dark red. If the latter is the case, the patients may receive a prescription mouthwash. The hygienist also checks for cavities, sores and lesions. Should periodontitis be detected, remedial action will be taken by the dentist because it can cause tooth loss and even an increased risk of heart attack or stroke or other serious health problems. If full mouth x-rays are on file, an x-ray will likely only be taken if there is a problem or if the x-rays need to be updated. And now the hygienist and patient await the dentist’s arrival. They will make the final inspection and recommendations. Hopefully, the dentist does not find any problems; but, if, for example, a tiny cavity should be found, there is not much involved in filling it. Patient files will already have on them the medications they take; and this is important for a number of reasons, one of them being that they can cause dry mouth. Saliva is important to protect the health of the teeth and mouth. What is Enameloplasty in Cosmetic Dentistry?